Although the Dr Williams’s Library collections are richest for the history of Protestant dissent in England, its treasures include many interesting medieval manuscripts. One of these, MS Ancient 6, is currently being studied by Dr Laura Slater from the University of Oxford, as part of a project on Music and Late Medieval European Courtly Cultures. A psalter dating to the early fourteenth century, it was almost certainly made for Queen Philippa of Hainault, the wife of Edward III of England. A psalter collects together the 150 psalms of the Old Testament in a standalone book. 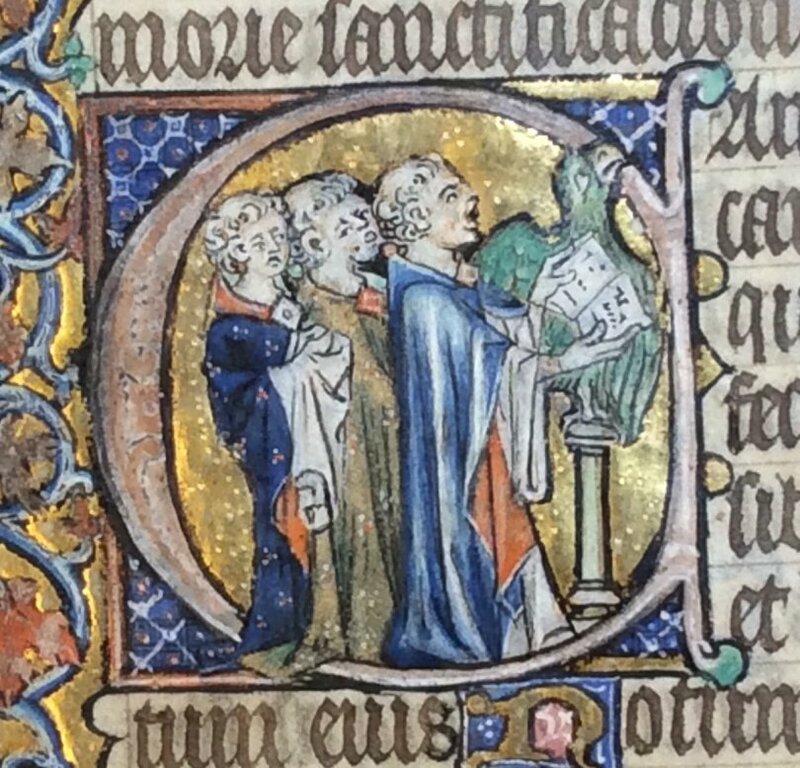 Reading the psalter was one of the most popular ways of worshipping God in the Middle Ages, whether you were a monk, a clergyman or an ordinary member of the laity. Singing the psalms was central to the celebration of the Divine Office. This was the cycle of eight services, from Matins to Vespers, performed day and night by medieval monks and nuns. Every week, all 150 psalms would be sung or chanted aloud in the monastery. Texts from the psalms, set to music in the form of antiphons, were also used in services attended by the laity, such as the Mass. St Augustine taught that singing the psalms ‘drives out the demons’ and ‘expels darkness, bringing sanctity to the sinful man’. ‘He who sings’, Augustine said, ‘prays twice’. So when it came to the public face of the medieval church- its liturgy, its preaching, its music and its institutions- the psalms were everywhere. Philippa of Hainault might have taken MS Ancient 6 to church with her each day, and read the psalms at the same time as they were sung by the choir, or chanted by the priest. This method of ‘praying twice’ did not only accrue twice the spiritual benefits; it also encouraged her deep engagement with the individual words of the psalms. MS Ancient 6 is an extremely small manuscript. Philippa could have held it in one hand while still following the service and saying her prayers. As queen of England, her every move would have been permanently watched: by security guards, by courtiers hoping to speak to her and gain favours from her, or by visitors appreciating the splendour of her dress and jewels. The tiny size of MS Ancient 6 may have enabled it to be one of the few queenly possessions used in public, but kept hidden from the prying eyes of strangers. How else were psalters used? But the psalms were also used in private. Psalters were sometimes known as ‘primers’, because young children learnt their letters from the psalter. Some manuscripts contained alphabets for this reason. They were also used for private prayer and devotional contemplation. Alcuin of York, an eighth-century scholar at the court of Charlemagne, writes how ‘in the psalms, if you look carefully, you will find an intimacy of prayer such as you could never discover by yourself’. The psalms offered practical advice on how to live your life: ‘Be angry, and sin not’ (Psalm 4:5). They provided solace and comfort in times of trouble: ‘Out of the depths I have cried to thee, O Lord’ (Psalm 129:1). The psalmist celebrates joyfully, trusting completely in God. S/he also cries out in rage, hopelessness and despair: ‘my spirit is in anguish within me: my heart within me is troubled’ (Psalm 142:4). When Philippa of Hainault opened MS Ancient 6, it didn’t matter what mood she might be in. There would always be a psalm to suit or soothe it. Many medieval women attached their prayer books to their girdles by a chain, keeping the book in a pocket in the folds of their long skirts. 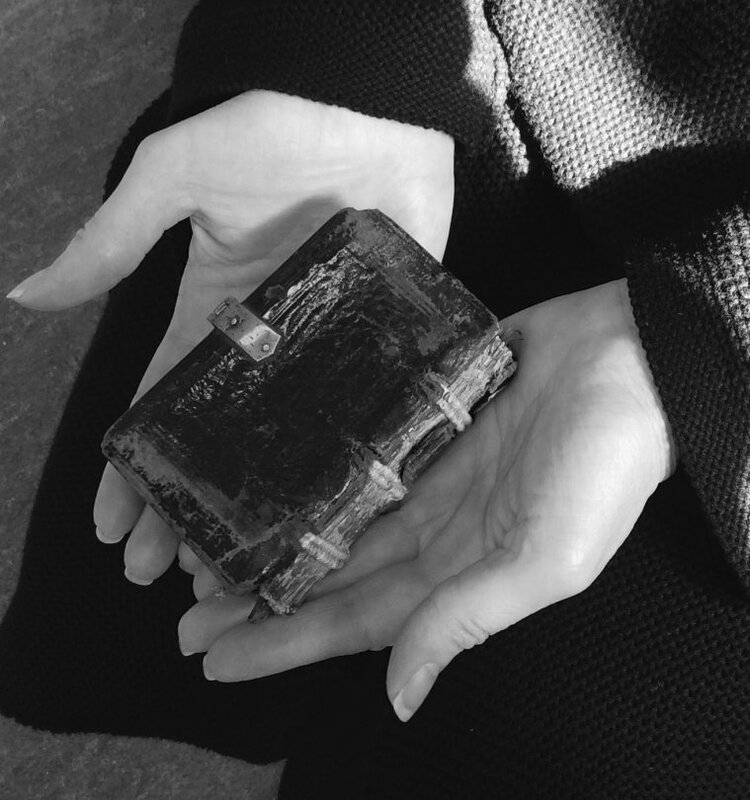 In this way, they always had their prayer books to hand, available for whenever they might be needed. Philippa might have reached for her psalter frequently. When she arrived in England to marry Edward III, she was extremely young, aged between 10 and 15. It was perfectly possible that she would never see her family again, perhaps dying in childbirth or from illness soon after arriving, and she would not have spoken any English. MS Ancient 6 may have been designed as a personal spiritual guide for her, intended to help her in her new life as queen of England.